Life is turbulent. On that, we can all agree. Disappointed dreams, broken relationships, identity crises, vocational hang-ups, wounds from the past-there are so many ways life can send us crashing up against the rocks. In this deeply personal book, Jonathan Martin draws from his own stories of failure and loss to find the love that can only be discovered on the bottom. 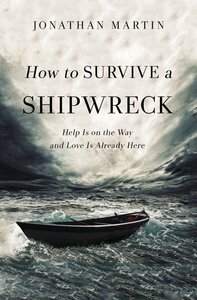 How to Survive a Shipwreck is an invitation to trust the goodness of God and the resilience of your soul. Jonathan's clarion call is this: No matter how hard you've fallen, no matter how much you've been hurt, help is on the way-just when you need it most. With visionary artistry and pastoral wisdom, Jonathan Martin reveals what we'll need to make it through those uncharted waters, how we can use these defining experiences to live out of our depths, and why it will then become impossible to go back to the half-life we once lived. About "How to Survive a Shipwreck"
He has taught English and English Literature for 15 years. Jonathan and his family live near Portland Oregon.